Backward Inclined Fan & Blower | AirPro Fan & Blower Co. The backward inclined fan (backward inclined blower) is highly efficient because it has simple, flat, backward inclined blades that minimize interference with the airflow as the air moves through the fan. It also offers lower sound levels and energy costs than many other fan types and includes a non-overloading horsepower design for low-pressure applications. Finally, the backward inclined fan is suited for clean air and/or high temperature applications. moves high volumes of clean air at lower static pressures. It is available in belt-driven, direct-driven, and direct-coupled arrangements with varying impeller and housing widths. 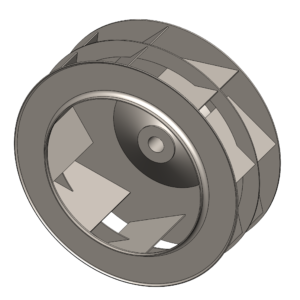 BIHD (Backward Inclined, High volume, Double width) – this backward inclined fan model is similar to the BIHS except that the impeller and housing are double the width. This gives the BIHD a higher air flow capacity. AirPro designs the backward inclined fan impellers with a focus on high operating efficiency, and we don’t compromise on high mechanical strength. Our robust design and construction features continue to serve our customers with reliable fan performance. Whether standard or custom, we build each backward inclined centrifugal fan with unmatched quality, and we back them up with responsive, respectable service. At AirPro, our engineers apply decades of fan engineering experience to craft fan solutions. So, we know how to design and manufacture backward inclined blowers and fans, along with our other models, to meet or fit many needs and applications.